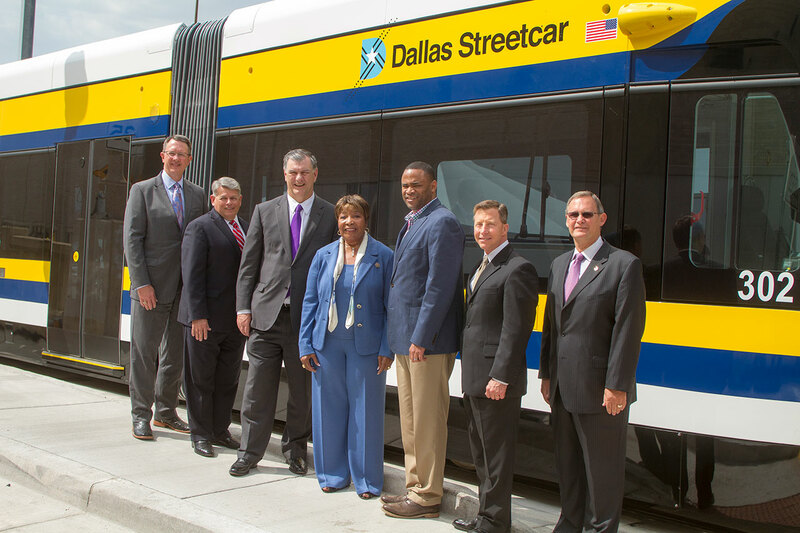 Today, DART was joined by Dallas Mayor Mike Rawlings, DFW International Airport Executive Vice President of Operations Jim Crites, Dallas County Commissioner Mike Cantrell, U.S. Rep. Eddie Bernice Johnson, U.S. Rep Marc Veasey and others from the Federal Transit Administration and North Texas Council of Governments to send a message to Congress that it’s time to fund a long-term surface transportation bill. The event was held near Union Station in front of the brand new Dallas Streetcar. Johnson heralded the Dallas Horseshoe project and Crites spoke about the growth of DFW International Airport as other reasons why a long-term surface transportation solution is essential. Stand Up for Transportation Day is a nationwide effort where hundreds of a transit agencies came together to urge Congress to provide a long-term investment in our nation’s transportation infrastructure. More information about Stand Up for Transportation Day can be found at standup4transportation.org/. “I call on anyone with a voice in Washington to speak up! Stand up for public transportation,” said Rawlings. Want to keep doing your part beyond today? Sign up to become a part of Voices for Public Transportation at voicesforpublictransit.corg. This entry was posted in DART Events, Photos, Video. Bookmark the permalink.